I saw fourteen films at this year's TCM Film Festival. The first day was a sort of warm up with two movies. Then I had the most bonkers Friday, where I watched six flicks. That's basically only watching movies from 9am to 2am. I never quite got full energy back after the second day, but I had plenty of what I've started calling "festival adrenaline" to keep me going. That and caffeine. One of my big goals for the festival was to watch a movie beside the gorgeous Roosevelt Hotel pool. The first night was the perfect time to do this, since the opening night party overflowed into the pool area. Before the movie there were dancers in 50s outfits performing around the pool. A DJ who was supposed to look like Wolfman Jack, but who had a wig that made him look more like Wayne Newton, spinned some great tunes. I didn't quite have my festival mojo yet, I think jet lag might have finally hit me, so I pretty much spaced out watching the dancers, but I really enjoyed the atmosphere. It was a perfect night to be outside. 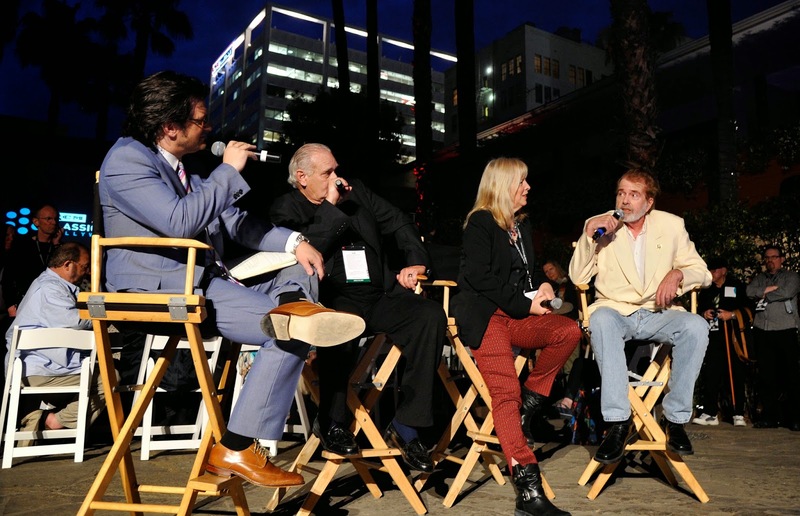 American Graffiti stars Bo Hopkins, Candy Clark and Paul Le Mat spoke with Ben Mankiewicz before the film. They had a good time kidding each other. Since Clark managed to drag John Huston's first name into three syllables, I think she might have been a little tight, which fit the party feel. It had been years since I'd seen American Graffiti and I really enjoyed the youthful energy (and soon-to-be famous stars) of the production. It was the perfect way to start the festival. I should also mention that we ate fries from Mel's Diner, just like the drive-in in the movie. I had to leave American Graffiti early so I could catch this wonderfully odd western with Joan Crawford, Mercedes McCambridge and Sterling Hayden. This year marks the 60th anniversary of the flick, and the premiere of a new restoration. Film archivist Michael Schlesinger introduced the movie and he was hilarious. This self-deprecating, seriously silly man could be a stand-up comic. He got the audience ready for a wild ride, preparing everyone for the most bizarre moments in the movie. 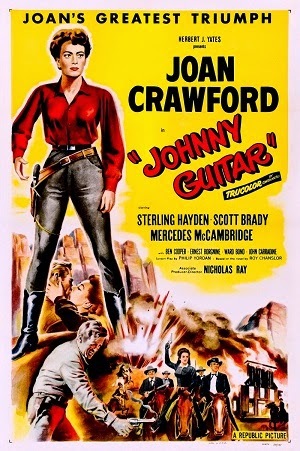 The print was gorgeous and Johnny Guitar was every bit as campy and strange as I remembered. This isn't to say the film is insubstantial though. It's gorgeous to look at, full of tension and the performances, especially a delirious turn by the movie-stealing Mercedes McCambridge, are flawless. Starting the festival with a pair of fun, undemanding films was the ideal cure for jet lag. I continued with my western theme (and John Carradine theme, he was in both movies) the next morning with the John Ford classic that made John Wayne a star. This is such a perfectly balanced film. For one, it's gorgeous, filmed with the care of an artist swiping a brush across a canvas. Who else but Ford could give you chills by simply filming the Duke walking down a hallway? Stagecoach also handles many elements beautifully. It succeeds as drama, action and even a comedy. That last part was a surprise for me. The audience laughed often, and yet there were also moments of unbearable sadness and intense action. This has got to be one of the most remarkable casts ever assembled too, including Claire Trevor, Thomas Mitchell and Andy Devine. Author Nancy Schoenberger, co-author of the fascinating Furious Love: Elizabeth Taylor, Richard Burton, and the Marriage of the Century, introduced the film. She's working on a book about the relationship between Ford and Wayne. I can't wait to read it! Oh how I love this film! It's a bit of an obsession for me. Apparently I'm not alone: I chatted with a lady in line who had seen it ten times. It's documentary about a mother and daughter, known as big and little Edie, who are the aunt and cousin of Jackie Onassis. Grey Gardens explores their lives in a decaying mansion in the Hamptons, and the film is unique by any standard. It tells the story of these two eccentrics shut away from the world in a manner so compassionate that you question why you ever could have judged someone just for being a little unusual. I was a bit disappointed in the audience experience for this one. It is a seriously quotable film, with lots of classic, funny moments. I was hoping to watch it with a crowd anticipating and applauding all those brilliant things, but it was not to be. I think the movie was new to too much of the crowd. I've since heard that you have a much more party-like atmosphere watching Grey Gardens at the Castro in San Francisco. I'm sure of that! Might need to make a trip down the next time they show it. 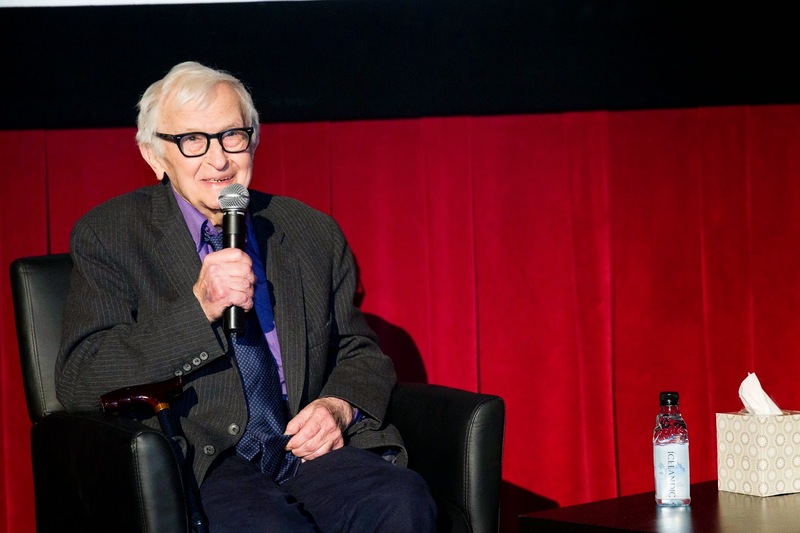 Co-filmmaker Albert Maysles made an appearance before and after the film, and it was marvelous to see him. He spoke about his philosophy as a documentarian, essentially that it is important to have affection for the subject. He and his brother David had originally planned to make a film about Princess Lee Radizwell, but he said that when he met her cousin Edith, "it was love at first sight." Maysles also said that upon seeing the film for the first time, Little Edie stood up and said, "the Maysles have made a classic!" I can just picture that. It was an honor to get a glimpse of this deeply compassionate, observant director. Part of the fun of seeing this glorious MGM musical was getting a chance to check out the gorgeous restoration of the Grauman's Chinese Theater (today known as TCL Chinese Theater). Getting a chance to see films in some beautiful old theaters is definitely a huge perk of attending the festival. I was delighted to meet a fellow Seattleite while waiting in line. She and I chatted about Seattle International Film Festival, of which we have a great deal of city pride! We joined a bunch of bloggers in the second row, which provided a perfect view of Margaret O'Brien, who I discussed in my previous Stars post. I've never been a fan of episodic movies, and while I've always appreciated the production quality of Meet Me in St. Louis, I was never very interested in watching it. Seeing it on the big screen changed my mind in a big way. Musicals really should be seen that way, with a large, enthusiastic audience. I also enjoyed the edge O'Brien's character had. She was quite the troublemaker, even making a streetcar go off the tracks for a prank. A lot of musicals may look like they're all sweetness and light, but that's usually just a camouflage for some dark stuff. 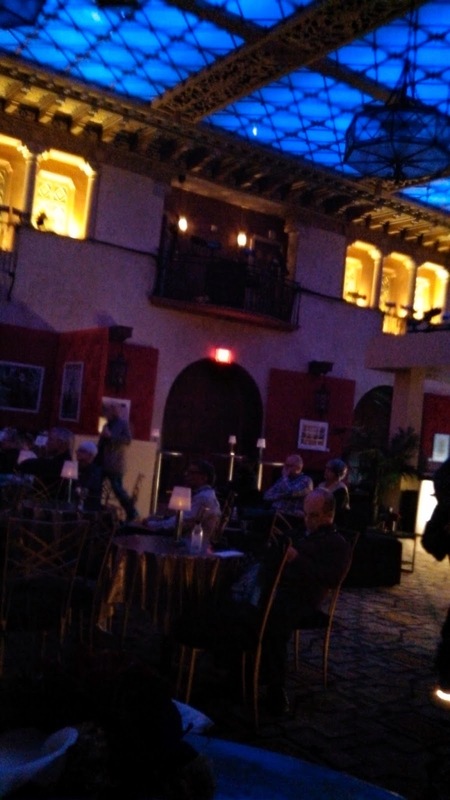 After a quick break for food, it was time to dash to the Egyptian Theater (another gorgeous old building) to catch the debut of Carl Davis' new score for this underseen Harold Lloyd silent. Leonard Maltin interviewed Suzanne Lloyd, the comic's granddaughter. She has worked very hard for several years to protect her grandfather's legacy. I'd never seen a silent movie with a full orchestra before, and it was an entirely different experience from an organ or a lone piano. We all gaped at the musicians when the film began, in awe of the gorgeous music. About five minutes later, we totally ignored them, which is a testament to the perfection of the score. The restoration was just as beautiful as last year's new print of Safety Last! (1923). It was an amazing movie experience, with all elements working together brilliantly. Ms. Lloyd should be very proud of her work. And then of course there was the movie. It was hilarious; definitely deserving of classic status. Lloyd's use of a seven foot giant for several bits was clever and inventive. This was one of my favorite movies at the festival. As soon as Why Worry? ended, a few of us made a mad dash down Hollywood Boulevard to catch a screening of this funny, and often very dark, pre-code at the TCL Multiplex. Since it was screening in one of the smallest festival venues, we were lucky to get in. Film Forum Repertory Programmer, and Founder of Rialto Pictures, Bruce Goldstein introduced the movie with a segment he cheekily called "Pre-codes 101." Though I'm a huge fan of this period in film, I learned a lot from his talk. He also showed a great reel of clips from some of my favorite pre-codes. There were even some movies I hadn't seen! The movie was a serious crowd-pleaser, with lots of typically pre-code naughtiness, snappy humor and Depression-era social commentary. I was grateful that we managed to squeeze into this popular screening. I needed a major infusion of caffeine to make it through the screening of David Lynch's excruciatingly brilliant feature debut, but I was determined to make it through. I'd only seen the film on DVD and I wanted to check out the audience reaction to this strange and often revolting masterpiece. My husband once saw it in a theater, and he said it was the quietest audience he'd ever been in. 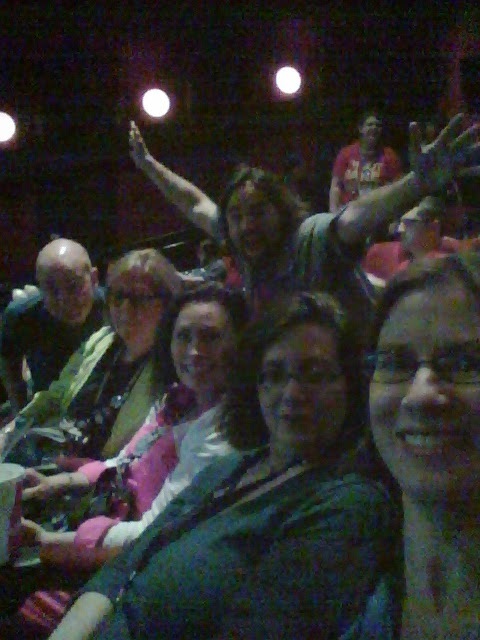 There was a party atmosphere in the theater before the TCMFF screening. I think everyone was delirious from exhaustion and a bit high from double espressos and cola. Patton Oswalt's introduction was hilarious, he welcomed us to "Coachella for shut-ins," which is a perfect description of TCMFF. However, once the movie started, it was dead silent. Eraserhead is a tough film, especially when you have already seen five films that day. I found it challenging to make it through, but there's something about it that draws me in. Perhaps because it is so personal and yet also so open-ended that you could easily give it your own interpretation. As tired as I was, it wasn't easy to sleep after watching this intense flick. All photos property of A Classic Movie Blog unless otherwise noted. Yeah, I agree that Eraserhead is really a tough one to understand. David Lynch is really something on with his films. It needs a lot of focus and attention to fully understand what was the film talking about. But despite all this, Eraserhead is still one of the best classic film I really love watching 'til now. Being made for about 5 years and recognized as one of the Hollywood Movies that Took Too Long to Make is totally amazing!